23 bedtime songs by music's beloved composers. As long as there have been children, there have been lullabyes. 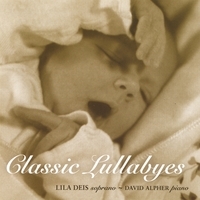 Lullabyes capture the quiet intimacy of adult and infant, express our devotion, convey hope for the future, and provide solace for life that is sometimes painful. Classic Lullabyes presents 23 songs by music's beloved composers including David Alpher, Brahms, Puccini, Wagner, Foster, Schubert, Rimsky-Korsakov, and de Falla. Each of these great lullabyes creates a special mood and tells its story, beautifully.